Former Blount County resident Bonnie Loftis Mason Atchison was recently inducted into the Alabama Senior Citizens Hall of Fame as a permanent member of the Class of 2018. Atchison, 86, who now resides in Columbiana, is the daughter of the late Horace and Ruth Loftis. She had three siblings, Bill, Jim, and Betty. Growing up near Remlap, Atchison attended fifth and sixth grades at Remlap Elementary before attending Blount County High School in Oneonta. She was a member of the band and a majorette. After the football games, she and her friends would have to walk from Remlap to their Red Valley homes. She recalled as she and her friends walked those long roads, they would sometimes see the Harvest Moon shining down on her father’s watermelon patch. There they would stop and help themselves to a watermelon or two that they would bust open. They would then eat the fruit with their hands, as they did not have a knife or any type of utensil to scoop out the innards. Atchison vividly remembers having to walk approximately three miles from Red Valley across the mountain and back each day to attend school. At times the walk was hampered by cold or rainy weather. She was thankful for the days when their neighbor would have enough gas to take his children to school in his old truck. He would take Atchison and her siblings along in the truck. He had built a covering over the truck bed and benches for everyone to sit on. Prior to graduating, Atchison dropped out of high school and married her high school sweetheart, Louis Mason. She did, however, get her GED to finish out her high school education. This marriage produced two sons, Mike and Kim. Her life with Louis took her to places such as Ft. Knox, Ky., Birmingham, Louisville, Ky., and Locust Fork, where Louis was the preacher at Locust Fork Baptist Church for three and one-half years. It was there that he passed away in January 1967. Atchison reminisced about attending the inaugural class held at Jefferson State Community College. She laughed as she talked about walking to the first day of classes with her friends on the rain stricken dirt road. She remembers everyone walking into the halls of the school that were pristine white. She said, “There was so much mud in that beautiful building. I don’t know how they got it clean.” The group was later dubbed the Mud Kids. Introduced by a mutual friend, Atchison married Harry Atchison nine years after Louis passed away. They were married 35 years before his passing seven years ago. Throughout her life, Atchison was the principal at Palmerdale Baptist School for one year, a teacher at Locust Fork for four years, and a teacher for Shelby County High School for 20 years. 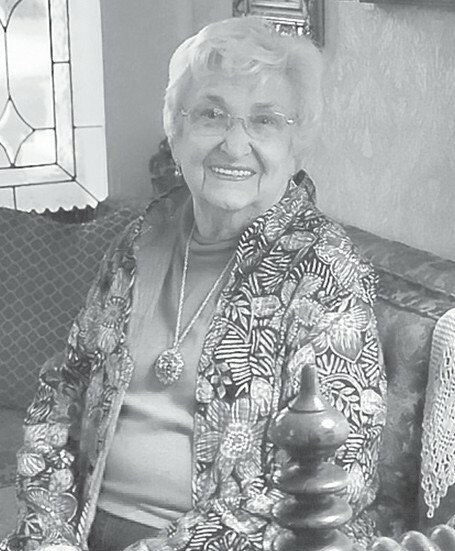 She served as the founder and director of the South Shelby County Chamber of Commerce for 10 years, and curator at the Karl C. Harrison Museum of George Washington for 10 years.